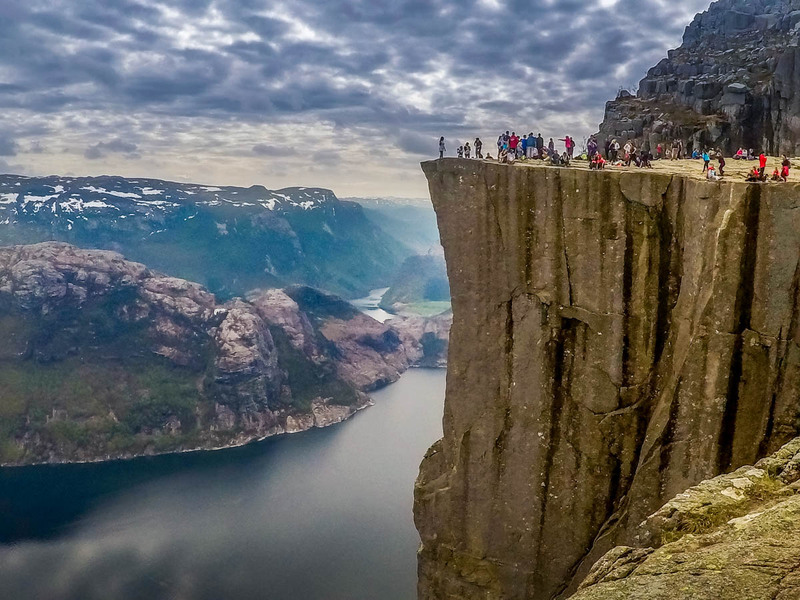 Preikestolen, or Pulpit Rock, as it is known in English. You may not recognise these names but I would suggest that more of you that do not register them as familiar will recognise the flat topped mountain plateau and the sheer cliffs that plunge 650 metres below it. 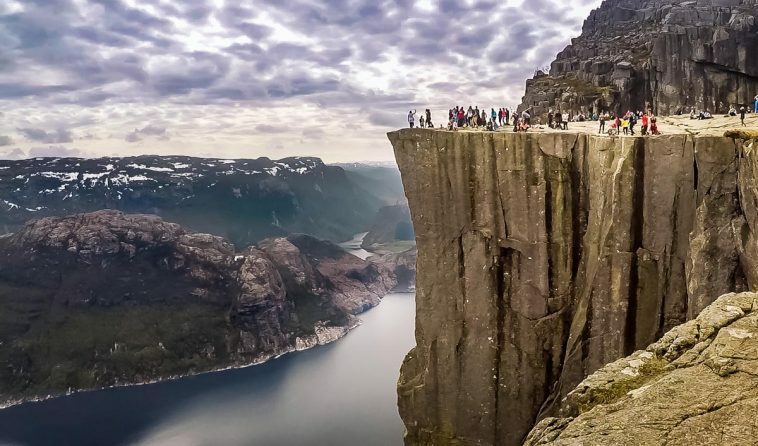 The most famous walk in Norway, the peak is a 25 metre wide viewing platform created by nature that looks over Lysefjord, before plunging vertically 650m down to the water below. 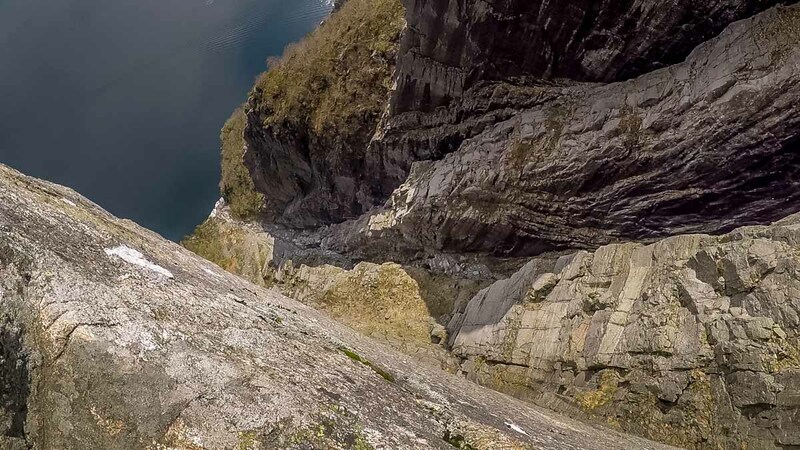 It is a base jumper’s dream. 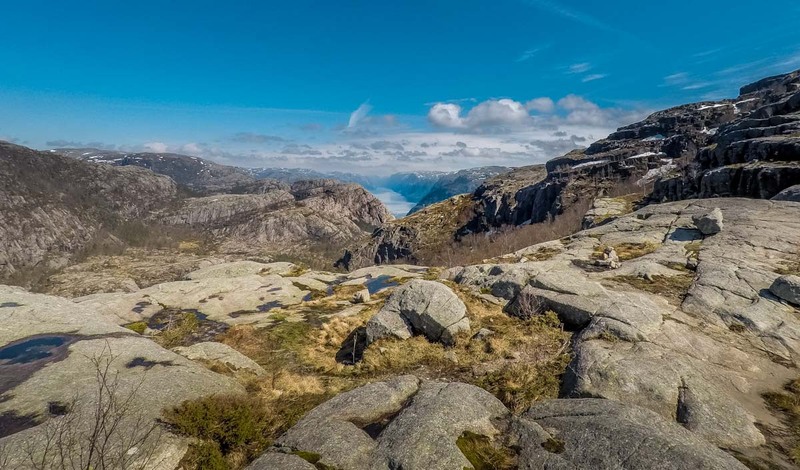 I talked about Stavanger in my previous post but this was the real reason that I had come to this part of south western Norway and hiking up to Preikestolen was the highlight of my recent trip. We had been enjoying Nordic cuisine and the cafes and bars of Stavanger, but as the clouds started to clear, the mountains across the bay to the East became more visible reminding me why I had come. 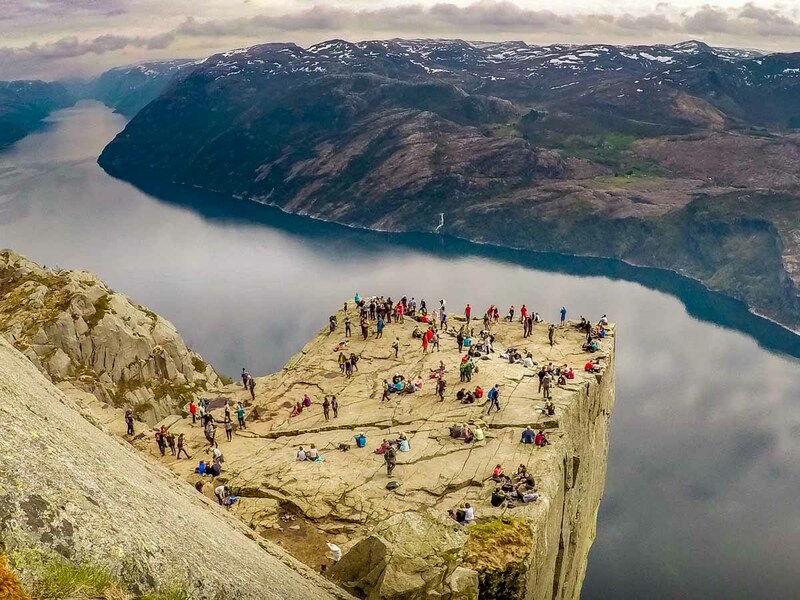 When I was planning by Norwegian trip, as soon as I realised that Preikestolen was within easy reach of Stavanger, I was sold on my destination. 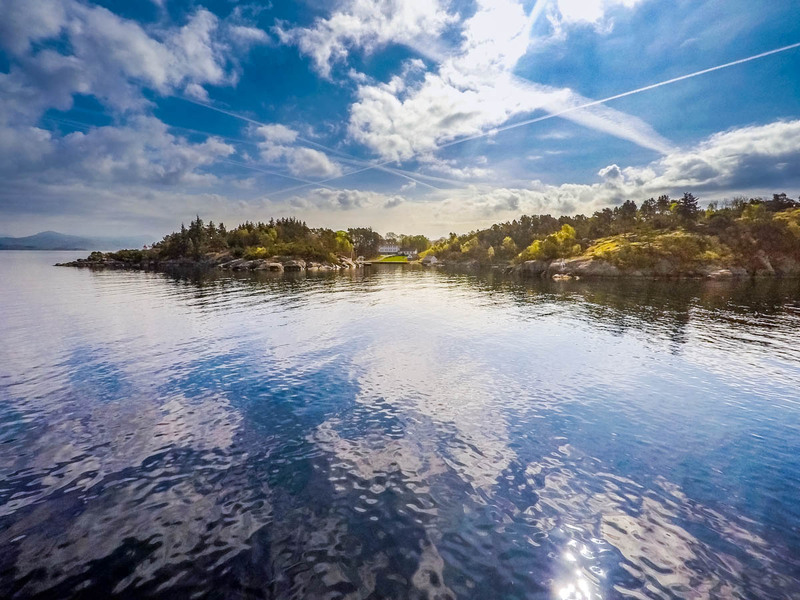 The route starts with a ferry ride from Stavanger across the bay to the port of Tau. We had hired a car so drove onto the ferry, but many of the other hikers had walked on, opting instead for the ferry plus bus option that runs regularly through the day. There are other ferry and boating trips available from Stavanger that will take you into the Lysefjord with views up to Preikestolen from below, but I knew that the best view was from up above. 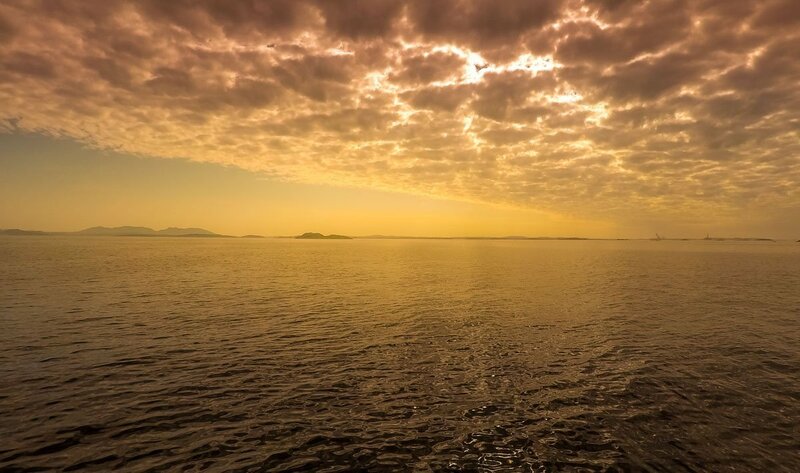 The stretch of sea between Stavanger and Tau is well sheltered by the mainland and islands that almost enclose it, so the water is flat and the journey across is a calm one. 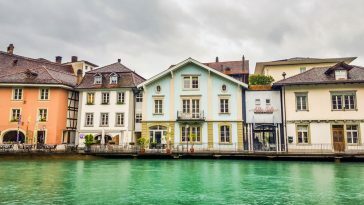 There are a few small islands dotted in between where you can see the odd secluded dwelling of those whom are not so keen on city living as well as plenty of birdlife. As ever, though, my eyes were drawn to the mountains and the sheer sided cliffs of the fjord-side peaks that I could see in front of me. The drive to the carpark at Preikestolen was a short 20 minute ride through countryside that was already much more dramatic. Big hills were all around us, forests, rocky outcrops and sea views to our right. The car park base has a cafe and some facilities where the ill-prepared can hire equipment including crampons – snow and ice can be on the path for 6 months a year and a slippy path next to a sheer drop is a friend to no one. We laced up our boots, packed our waterproofs and set off on what was a warm sunny afternoon. The route is a relatively short one and quite straightforward. The round trip is only 6km with around 350 metres of ascent and descent. The suggested walking time is two hours up and two hours back but we did it in less than that, although we were going at quite a pace on the way up. 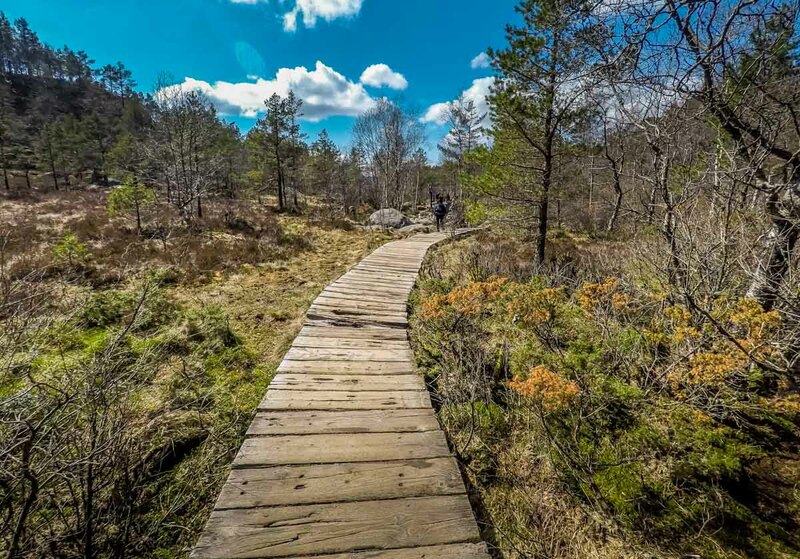 The path starts off with a sharp up hill climb through a forested area before levelling out slightly, passing through a marshy area where raised wooden platforms keep your ankles out of the mud. There are two more relatively sharp sections but the majority of the route is a gentle up hill amble. The path is clear and obvious so anyone with a reasonable level of fitness would be able to enjoy the walk as long as they can handle the exposure at the top. Nepalese sherpas have helped to restore the path in recent years and they’ve done a good job as it’s in excellent condition. 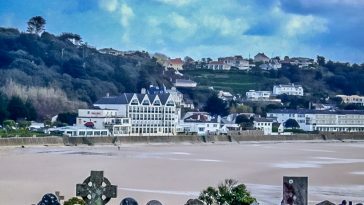 Ten years ago 60,000 people a year were doing the walk – now the number is more than 300,000 so steps are being taken to maintain the route as well as ensuring that tourists are well prepared for the walk. This is still high mountain country so the weather can turn quickly up there and people out on a day trip do get caught out by this. The route was busy on what was one the first warm weekends of the season but I enjoyed the walk up. After the marshy area the route became more rocky, passing a couple of small mountain pools, before views of the valleys and the other peaks around started to open up. Remnants of the winter months were still about as small sections of snow lay in sheltered gullies of north facing slopes but the paths were clear. Valleys started to drop below us and high mountain lakes were visible in the peaks around us. Eventually we walked up onto the shoulder of the mountain and the Lysefjord started to appear over the smaller hills below us. 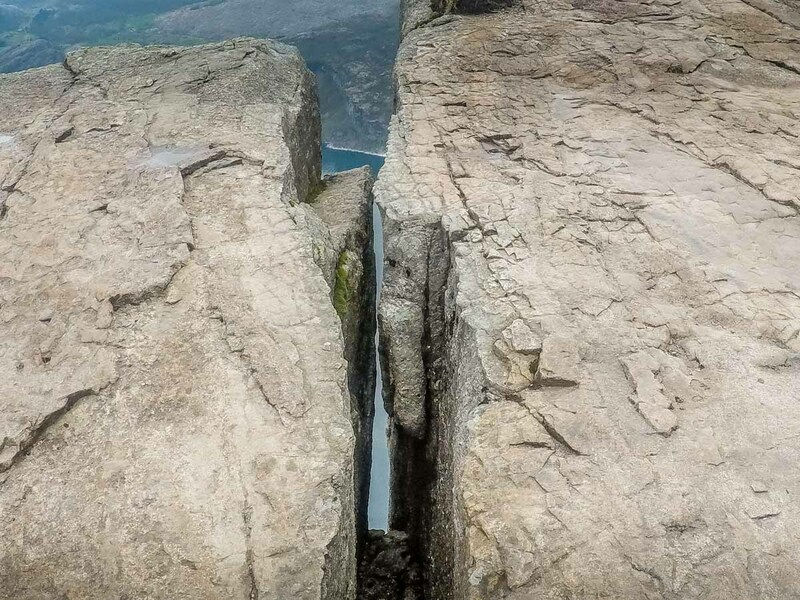 I had seen many photos of the Preikestolen before, including the view from the approach to it which exposes its dramatic plunging lines, but seeing it in real life is breathtaking. 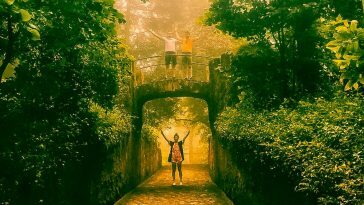 As you turn the corner that leads up to the peak’s plateau, the path that takes you there is a ledge which is a few metres wide. It’s perfectly safe but no doubt some people are surprised by the exposed drop at one side of it. 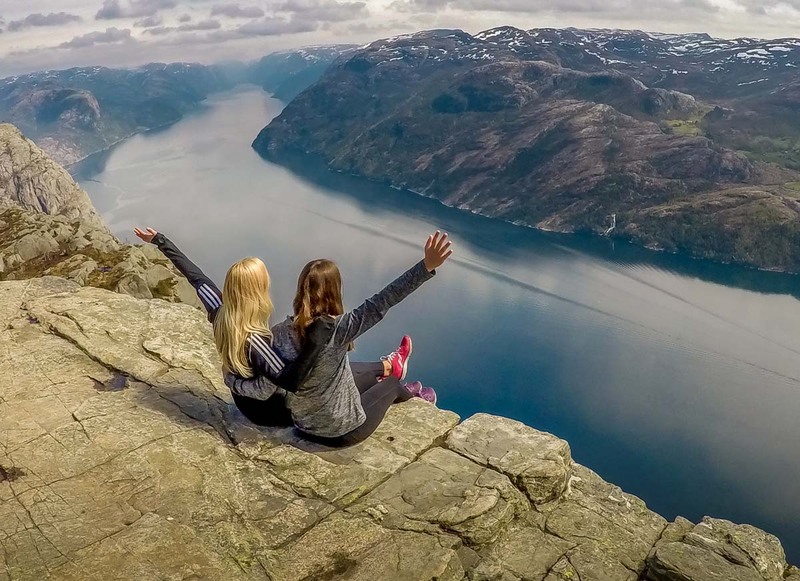 The Norwegians will not protect it, their view is that they cannot rope off their vast and rugged countryside and I agree with this, but tourists do need to take care here. There are likely to be many other people up here and you can never account for the actions of the clumsy. The plateau is around 25 meters by 25 metres wide so there is plenty of space, but it was busy when we arrived. People were waiting their turn to takes a photo near the corner edge where with the fjord extends into the distance below. Others were brave enough to dangle their feet over the edge. I crept up to the edge and looked over to the drop below me. I love to be high up; I’ve hung off the side of mountains in the Alps and done some of Scotland’s finest ridge walks, but I must admit that this made my legs wobble for a second. The panorama was amazing though. 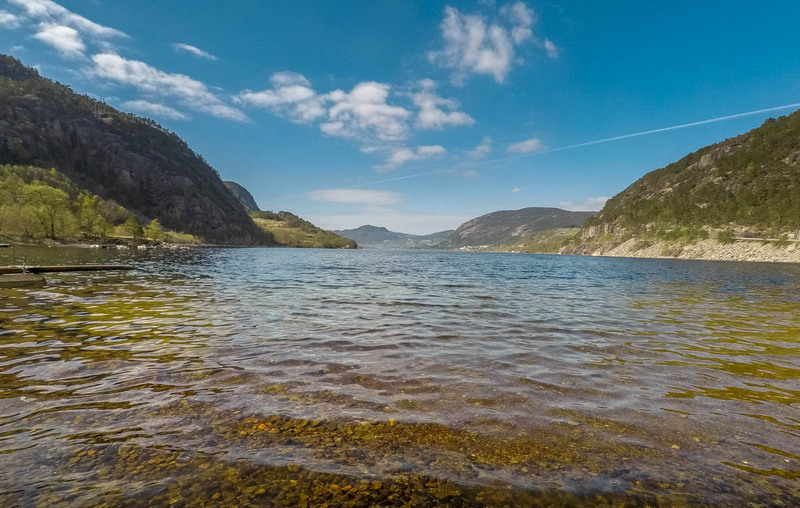 The fjord is magnificent and stretches out into the distance in both directions. You can only imagine the power of the glaciers that carved out the this handsome ravine. There are mountains as far as the eye can see, some still holding snow on their peaks in early May. 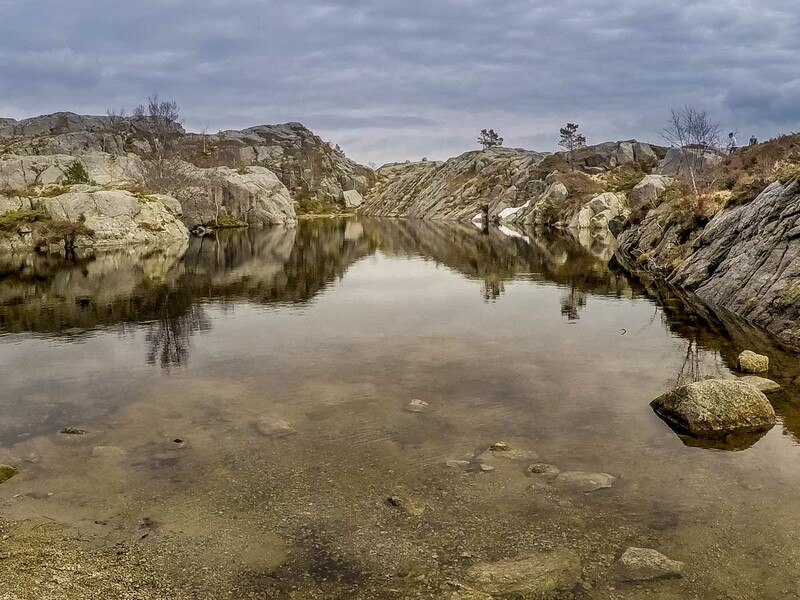 I scrambled up the rocks that sit behind the plateau to get a different perspective. The people below were taking in the views, enjoying some lunch, precariously creeping on hands and knees up to the edges, whilst others were staying as far away from the edges as possible. I climbed back down, took in one last look at the fabulous view in front of me and then headed back on the lovely amble back towards the car park. 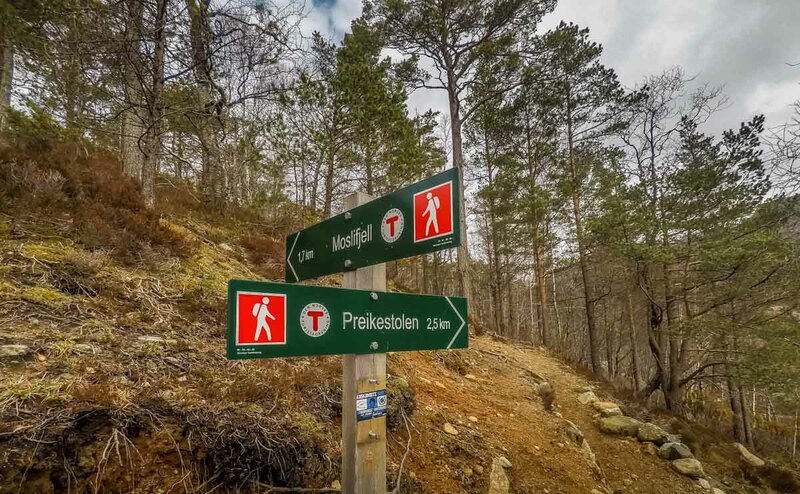 There are lots of other walks in this area and this was only a taste of what Norway has to offer but what an experience it was. Hopefully I will be back soon for much more. 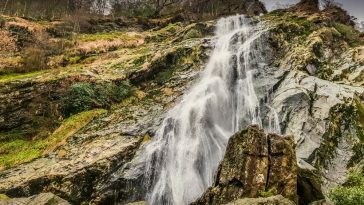 I love travelling, walking, hiking, and climbing up mountains in the UK and abroad. The highest I’ve been up is Kilimanjaro, but my favourite is the very small, but beautifully formed Loughrigg Fell in the Lake District.